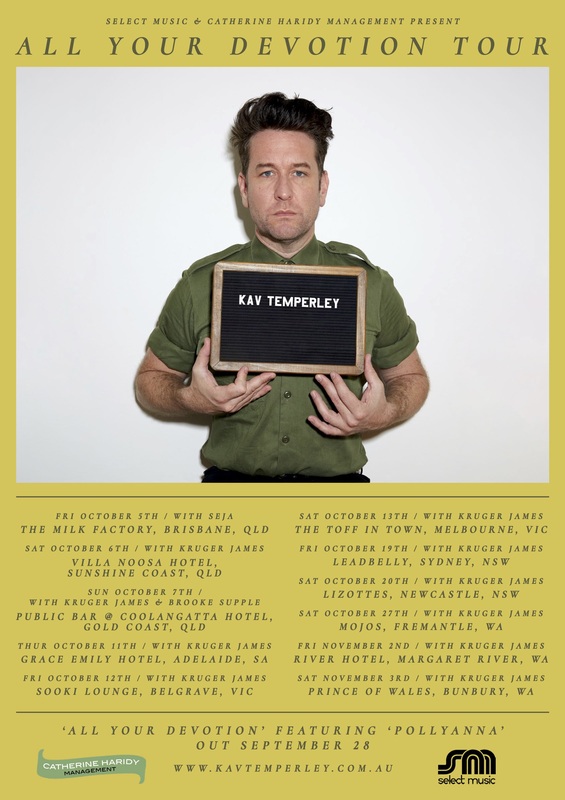 p style=”text-align: center;”>Best known as the frontman of the Australian rock n roll luminaires, Eskimo Joe, acclaimed songwriter Kav Temperley is stepping out solo. The first taste of his upcoming album dropped today in the form of new single, Pollyanna – an ominous reflection on the relativity of happiness – the single will be received instantly with all digital album pre-orders. Pollyanna precedes Kav Temperley’s highly anticipated debut solo album All Your Devotion, a collection of ruminating, thoughtful, and effecting songs from one of this country’s greatest talents, set for release digitally and on vinyl on September 28. To celebrate what is the culmination of years of hard work, Kav will be hitting the road in October and November this year, kicking off on October 5 at The Milk Factory in Brisbane, and moving through the Sunshine Coast, Gold Coast, Adelaide, Belgrave, Melbourne, Sydney, Newcastle, Fremantle, Margaret River, before wrapping up in Bunbury at Prince of Wales on November 3.